Maria McKeon co-founded Mary’s Place by the Sea by the Sea in 2009. Her passion for total wellness complements the organization’s focus on providing a place of rest and respite for women facing cancer by providing hope and support. She currently helps manage the growing Mary’s Place by the Sea organization. Maria is one of the first faces that women see when they arrive at Mary’s Place by the Sea by the Sea. She leads meditations, yoga classes, gives talks on prevention and health education. 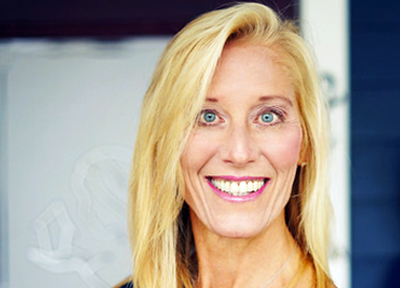 She brings more than 30 years of experience in health, fitness and wellness education, as well as wealth of knowledge from an early career in sales and marketing. Maria has a bachelor’s degree from Rowen University, is a certified health and wellness coach and yoga teacher. Maria has previously worked within the health and prevention communities of the greater Philadelphia, PA, Cherry Hill and Monmouth County, NJ areas. She has led support groups to fight eating disorders with the National Eating Disorder Association(NEDA). She has volunteered for Contact, a suicide prevention hot-line, prior to co-founding Mary’s Place by the Sea.